The video for this story about Colonel William Malone screened on TV3 News on 23 April 2015. William George Malone, commander of the Wellington Infantry Battalion, was one of New Zealand's outstanding soldiers of the Gallipoli campaign. A believer in duty, hard work, and a stickler for cleanliness, he was at first hated by his men for his standards of discipline. At Gallipoli he became a huge admirer of New Zealand soldiers, and critical of imperial officers and wild Australians. He famously led the Wellington Infantry Battalion to capture Chunuk Bair before dawn on 8 August 1915, and hold off repeated Ottoman counter-attacks throughout the day; Malone was killed at 5pm that afternoon from friendly fire. William George Malone was born at Lewisham, Kent, near London in 1859. His father, of Irish background, died when William was nine. He was educated at Catholic schools in England and France which left him with a strong Catholic faith, a fluency in French and a love of classical music. In 1879, aged 20, he left for New Zealand and joined his brother in the Armed Constabulary. He served in the attack on Parihaka in 1881. He purchased land, became a farmer at Stratford in Taranaki, a land agent, and also qualified as both a solicitor and barrister. In about 1902 he moved to New Plymouth. He also played rugby for Taranaki, served in local government and stood as an independent liberal for Parliament. He had married Elinor Penn, with whom he had a daughter and four sons (two of whom, Edmond and Terry, were to serve at Gallipoli); she died in childbirth in 1904. The next year he married Ida Withers, with whom he had two sons and a daughter and with whom he was deeply in love. In 1900 he helped form the Stratford Rifle Volunteers before joining the 4th Battalion Wellington (Taranaki) Rifle Volunteers, of which he was commanding officer by 1910. He became convinced about the likelihood of imminent war – so he studied military history and military manuals, gave up alcohol and tobacco, kept himself physically fit, and slept on a military stretcher, not a soft bed. When the territorial system began in 1910 he became lieutenant-colonel and commanded the new 11th Regiment (Taranaki Rifles). At the 1911 annual camp it rained heavily and he realised the men’s slough hat collected water in the dent. So he asked the men to pinch the hats into a crown – the lemon squeezer which deflected the rain and mirrored the shape of Mt Taranaki (which was on the 11th Regiment badge). From September 1916 the lemon-squeezer became the accepted style for the New Zealand army. The day after news of the declaration of war, Malone volunteered, and two days later he was appointed to command the Wellington Infantry Regiment. He was aged 55. Teach the children the doctrine of work and duty – duty to themselves – their fellows and above all to their country! I am beginning to think the only way is to have a council of one, myself, and simply issue orders. It was most interesting but ugh! The filth and smells of the Arab streets and the dirt of the Arabs. On 6 December they set up at Zeitoun Camp outside Cairo and began hard training. Malone met English soldiers, commenting that ‘the men seem all like boys, so short, small and fair’ and the officers seemed less practical than colonial officers. As always Malone made himself comfortable – his table was covered by a New Zealand flag with Union Jack folded in! On 26 January the WIB was sent for a month to defend the Suez canal from the Ottoman Turks, and after further training they left on 19 April 1915 for Gallipoli. I think of you every day – the first and last things and pray that you and the children are well… I am proud to know that my wife is so brave and so full of the sense of duty to country. He exchanged flowers with her by putting them in his letters. There are also charming letters to his children (he always chatted with children whenever he met them). Until 5 May he and his men were on Walker’s Ridge where Malone worked hard to organise the lines and make them safer. From 6-19 May he and his men sailed south to Cape Helles and took part in a bloody advance as part of the second battle of Krithia. On 1 June he was given responsibility for Courtney’s Post, a precarious position on the front line, and worked hard to strengthen it and make it more secure. 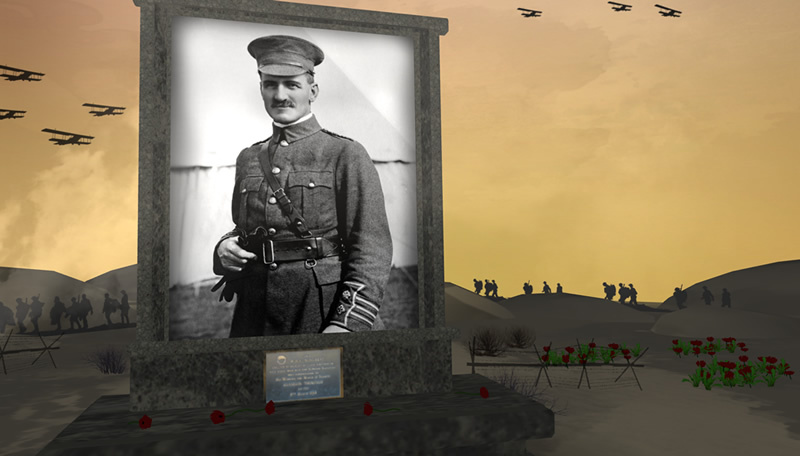 On 9 June he was transferred to the most precarious position on the front line, Quinn’s Post. At that point the Turkish trenches were in places only about 15 feet away and men were constantly exposed to fire. Through huge work, digging, sand-bagging and the ‘cultivation of domestic virtues’ he turned Quinn’s Post into a safe area where the Anzacs had clear dominance. He was so exhausted during this period that his diary entries dribbled away. In early August he and his men began preparing for the advance on Chunuk Bair. We are pleased to be moving but the men are run down and the reinforcement men are in a big majority so I am not too sanguine about what we can do. On 5 August, before moving to Happy Valley to assemble, Malone wrote three letters to his wife, which suggested he knew death was coming. In the early morning of 7 August Malone and the WIB reached the Apex, with Rhododendron Ridge heading up to Chunuk Bair. The Auckland Battalion were ordered to advance up the ridge but were totally exposed to Turkish fire and were decimated. Malone was ordered to advance but flatly refused: ‘I am not going to ask my men to commit suicide’. He was later criticised for delaying at this point. But it would have been a disastrous loss of life. Instead the men dug in and at 4.15am on 8 August 1915 they did advance up the ridge and occupied Chunuk Bair. Malone had argued with his officers about where the trenches should be placed. He had read and accepted the argument that trenches should be positioned on the reverse slope where the men would be less exposed to fire. Later he was criticised for positioning his trenches on the reverse slope on Chunuk Bair. But the evidence is that in fact he occupied old Ottoman Turk trenches on the forward slope, as well as digging new trenches on the reverse slope and built links between the two. But the ground was hard clay and the trenches were shallow (about 1.5 metres at most), so when the Turks attacked them men were very exposed. They held on despite heavy losses. It is said that Malone with bayonet drawn led attacks on the advancing Turks. At about 5pm a shell, fired either by New Zealand artillery or from a Royal Navy destroyer, exploded above Malone’s head and killed him. When reinforcements arrived, the WIB withdrew – there were only 50-70 left unwounded from the 760 who had advanced from The Apex that morning. New Zealand reinforcements held on all the next day but on 10 August, after they in turn had been relieved by British battalions, the defenders were overwhelmed and Chunuk Bair fell. Malone was blamed unfairly for the failure to hold Chunuk Bair; but he was honoured by the men he commanded. On 21 August 1915 the Wellington Infantry Battalion held a memorial service for Colonel Malone; and on 8 August 1923, exactly eight years after his death, the large white Malone Memorial Gates were opened in his honour at Stratford.